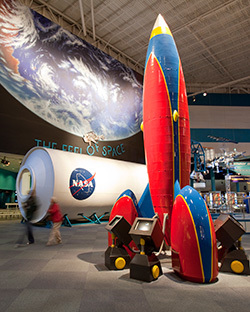 Space Center Houston is one of the area’s biggest attractions. Photo courtesy of the Greater Houston Convention & Visitors Bureau. Houston is definitely an oil city, with plenty of jobs even when the United States was in a recession. Forbes magazine has defined Houston as “cool,” partly because of its job growth and the resulting influx of young professionals. For visitors, its allure comes from its excellent museums and the romance of space exploration at a major NASA center. In this flat city, everything is Texas-big: the sprawl (a metropolitan area twice that of Los Angeles), the population (6.36 million, the nation’s fifth largest), the world’s largest medical center, the enormous synagogues, the outsize restaurant portions and the expansive Southern welcome. And though Houston is hot in summer, it’s hardly barren: Its flowing bayous and spreading live oaks that form broad canopies keep it green. Texans claim that the first Jew to set foot in what is now the United States was a Portuguese Converso, Gaspar Castano de Sosa, who crossed the Rio Grande in 1590 in search of silver. Other Conversos probably came around then to escape the Inquisition but left no traces of their Jewishness. Some of the Jews who settled in Texas while it was still under Mexican rule joined the fight for independence, and four people of Jewish descent died at the Alamo. The first recorded Jewish resident, in 1835, was French-born Eugene Joseph Chimene. The first evidence of communal life was the purchase of a cemetery in 1844 by the Orthodox, German-speaking Jews who founded Congregation Beth Israel. The congregation’s first building was inaugurated in 1870, when Houston had 245 Jews. Beth Israel eventually became Reform, and later immigrants from Eastern Europe founded two new Orthodox congregations: the Galician Dorshe Tov and the Russian-Polish Adath Yeshurun. In 1891, the two merged as Adath Yeshurun. The settlers were mainly peddlers and shopkeepers; the city’s first department store was established by Ed Klein. But there were also bankers and dealers in various commodities. Morris Levy helped organize the Houston Ship Channel Company and Henry Fox was a founder of the Houston Cotton Exchange. Meanwhile, Galveston, about 50 miles southeast of Houston, had become the largest city in Texas, the state’s main commercial center, a leading port for cotton exports and a cultural center with a thriving Jewish community and the first Reform congregation in Texas, B’nai Israel. But a hurricane in 1900 that devastated the city and killed 6,000 people drove coastal dwellers inland. That, plus the discovery of oil near Houston and the Galveston Plan—which diverted Jewish immigrants from East Coast cities—brought Houston many more Jews, new synagogues and Jewish organizations, including the Zionist Federation, the Workmen’s Circle and the Texas Jewish Herald. After World War I, Jewish servicemen stationed nearby settled in the city, which had 10,000 Jews by 1920. But Ku Klux Klan activity kept Jews from entering civic and political life in the 1920s and 1930s. Only in 1969 did the city council have a Jewish member, Richard Gottlieb. Beth El, the first Conservative congregation in Texas, was established in 1924; it merged later with Adath Yeshurun to become Beth Yeshurun. Meanwhile, Beth Israel had become the city’s largest congregation. In 1943, a radically anti-Zionist group there promulgated “basic principles” that excluded anyone interested in Zionism. Those who disagreed broke away and formed Emanu El (Reform). Beth Israel has long since become strongly pro-Israel. Before World War II, 75 percent of the Jewish population lived in an area called the Third Ward. Gradually they moved west, along the main bayou. In the 1930s, refugees from Germany arrived; after World War II, refugees came from Eastern Europe. By 1960, the city had 60 Jewish organizations affiliated with the Jewish Community Council. The first Jewish day school, the South Texas Hebrew Academy, was founded in 1969. Both Rice University and the University of Houston have Jewish studies programs. Houston’s estimated 45,000 to 50,000 Jews—almost one percent of the population—form a traditional Southwest community: About half of them belong to synagogues. The Orthodox Union has proclaimed Houston the place for Orthodox families; about 10 percent of the affiliated Jews are Orthodox (including Chabad). The rest are more or less evenly divided between Conservative and Reform. Seven day schools serve about 1,400 children, and the community supports meals on wheels and a home for the aged with assisted living and a 290-bed nursing home. Of Houston’s two mikves, one accommodates non-Orthodox conversions. Congregation Beth Yeshurun. Photo by Esther Hecht. Houston’s Jews work in medicine, law and other professions, in real estate and in manufacturing and construction businesses serving the oil and gas industries. They are strongly supportive of Israel, and the entire community marks Yom Hashoah together. Many of the Jews and institutions are in the southwest quadrant bounded by the Loop (Interstate 610), for example, in Bellaire and West University. But, in the past 30 years, many Jews have moved farther afield, mainly to the west or southwest, so that Meyerland has become a main Jewish area; Sugar Land is another. Consequently, older institutions have created satellite campuses and new congregations, mostly Reform, have been founded. The Houston chapter of Hadassah counts 4,000 members spread among 14 groups (www.hadassah.org/houston). Houston’s fifth (and current) City Hall (901 Bagby Street), built in 1938-1939 and faced with limestone, was designed by Joseph Finger, an Austrian-born Jewish architect who specialized in Art Deco. In the grillwork above the main entrances are medallions showing the great lawgivers, including Moses. The ground floor houses the city’s visitors center. Finger is buried, along with other notables, in an Art Deco mausoleum he designed at Beth Israel Cemetery (1207 W. Dallas Avenue), the city’s first Jewish cemetery. The older tombstones are in Hebrew, the newer ones in English. Adath Emeth, in Woodland Heights, which served a German-Jewish Orthodox congregation from 1923 to 1949, is the city’s oldest extant synagogue building. The red-brick structure at 1016 Houston Avenue (corner of Washington Avenue) is now Central Police Supply, an arms shop, and though the space for the Ten Commandments is still visible on the façade, the Star of David in the medallion below it has been sanded off. Five arched windows represent the Five Books of Moses. Finger also designed Houston’s second-oldest extant synagogue, which served Beth Israel, the oldest and largest Jewish congregation in the South, between 1925 and 1967. Today it is the Heinen Theatre, at 3517 Austin Street. The Tablets of the Law are visible on the beige-brick-façade above the massive columns at the entrance. The interior features a stained-glass skylight with a Star of David surrounded by lit menoras and, at stage rear, an inscription over the site of the Ark. Next door is San Jacinto High School, once called “San Jewcinto” because of its large Jewish enrollment (1300 Holman Street). Among its notable alumni was author David Westheimer (Von Ryan’s Express). The beige-brick home of Congregation Beth Jacob between 1940 and 1960 (4017 Hamilton Street) is today the True Light Baptist Church. A menora is still visible on the front, but the Tablets of the Law are partly obscured by the word “John.” Inside, the former mikve is used for baptisms. Across the street, at the corner of Cleburne and Ennis Streets, Jewish children once attended Albert Sidney Johnston Junior High before going to San Jacinto. Today, the school is the Young Women’s College Preparatory Academy. Nearby, at 3100 Cleburne, is the low-slung brick building that Congregation Adath Emeth used between 1947 and 1959. It is now the Charles Rhinehart Music Center Auditorium. Congregation Beth Yeshurun also had a brief stay (1950 to 1962) in a building nearby, at 3501 Southmore Boulevard. A Star of David can be seen on the floor in the entrance and on a sign over the doors. The sanctuary was never built. Houston’s second Jewish Community Center (the first one no longer exists), open between 1951 and 1969, is a Modernist red-brick building designed by Jewish architect and Frank Lloyd Wright fan Lenard Gabert. It is now the Judson W. Robinson Jr. Community Center (2020 Hermann Park Drive). There are several vibrant congregations welcoming worshipers today. United Orthodox Synagogues—which is Modern Orthodox—has a mikve, supervises an eruv and has the only Jewish Montessori preschool in the Southwest (9001 Greenwillow Street; 713-723-3850; www.uosh.org). The most striking aspect of many other Houston synagogues, beyond their size, is the quantity of art on display. The brown-brick Beth Yeshurun (4525 Beechnut Street; 713-666-1881; www.bethyeshurun.org) with its soaring, futuristic roof—the largest Conservative synagogue in the country with a membership of 2,500 families—also has a chapel where Orthodox services are held. The art displayed includes glass panels with biblical scenes and works by Israeli artists Yaacov Agam and Reuven Rubin. A Holocaust memorial by Nathan Rapoport is on a black marble background. The synagogue’s Mollie and Louis Kaplan Judaica Museum features an unusual 18th-century hanukkiya for candlelighting in the synagogue. In the sanctuary, stained-glass windows depict the 12 tribes. Holocaust Museum Houston. Photo courtesy of the Greater Houston Convention & Visitors Bureau. Brith Shalom is a Conservative offshoot of Beth Yeshurun, founded by families that had moved to the suburbs and wanted more of an emphasis on education (4610 Bellaire Boulevard; 713-667-9201; www.brithshalom.org). It is a smaller congregation with significant member participation and a strong social action program. The Reform Emanu El (1500 Sunset Boulevard; 713-529-5771; www.emanuelhouston.org) is five miles northeast of the city center and across the street from Rice University. The red-brick building (designed by Gabert) has a sweeping gabled roof. On display are works by Andy Warhol, Agam, Menashe Kadishman, Marc Chagall and others. The Evelyn Rubinstein Jewish Community Center, housed in a striking building with a colonnaded entrance, offers a rich mix of arts and culture in addition to well-equipped fitness facilities. The cultural highlight is the annual Jewish Book Fair, which attracts up to 10,000 people. Other cultural events include lectures in conjunction with Rice University’s Jewish studies program, a Jewish film festival, theater and an Israeli dance workshop. 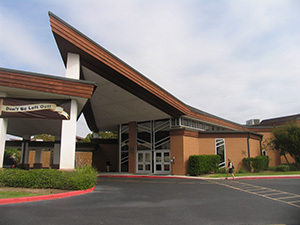 The JCC has a kosher café (5601 S. Braeswood Boulevard; 713-729-3200; www.erjcchouston.org). Of the 18 museums in Houston’s museum district, several are of Jewish interest. The Rothko Chapel, an interfaith sanctuary near St. Thomas University, was the vision of Houston art patrons Dominique and John de Menil. They commissioned Mark Rothko to paint 14 monumental panels to hang in an octagonal space; he considered these paintings his most important artistic statement. Rothko’s work is complemented by the sculpture Broken Obelisk, by Barnett Newman, set in the adjacent reflecting pool (3900 Yupon Street; 713-524-7461; www.rothkochapel.org). The Rothko Chapel is part of Menil Neighborhood, an art compound that includes the low-lying, cypress-clad main museum (1533 Sul Ross Street; 713-525-9400; www.menil.org), which showcases the core of the Menil Collection—modern European and American art as well as works from earlier cultures around the world—and other galleries and buildings. Houston’s Museum of Fine Arts (1001 Bissonnet Street; 713-639-7300, www.mfah.org) has two gallery buildings and a sculpture garden in the heart of the museum district as well as two house museums. In the main museum, in the exhibition “Splendors of the Ancient World,” note the “Judaic oil lamp, 5th-6th century AD bronze,” on which the handle has a menora shape. A dark cone rises from an inclined slope on which lie memorial plaques for destroyed Jewish communities, at the Holocaust Museum Houston, designed by Ralph Appelbaum (5401 Caroline Street; 713-942-8000; www.hmh.org). 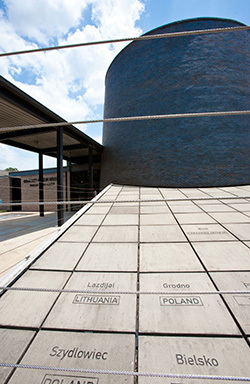 The museum depicts Jewish life in prewar Europe, the events leading to the Holocaust and life after the war, incorporating the testimony of survivors, liberators and witnesses who settled in Houston. At the Space Center Houston (1601 NASA Parkway; 281-244-2100; www.spacecenter.org), adjacent to NASA’s Johnson Space Center, visitors can see real space ships and moon rovers. Astronaut Judith Resnik, who died in the 1986 Challenger disaster and who was the first Jewish American and the second woman in space, is featured prominently. She is one of 14 Jewish astronauts; another is the Israeli Ilan Ramon, who trained in Houston and died in the 2003 Columbia disaster. Galveston’s Strand, a street lined with souvenir stores, an old-fashioned ice cream parlor and a chocolate factory, has the flavor of New Orleans. Many of the businesses—for example, Blum department store at No. 9—were Jewish-owned. Jews lived nearby, around 29th Street. Even today, the surf shop at the corner of 21st Street has a mezuza on the door. Stars of David appear in the mosaic floor at 2301 The Strand. 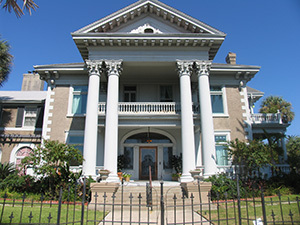 The former home of onetime Galveston mayor Isaac Herbert Kempner. Photo by Esther Hecht. Kempner Street and Kempner Park are named for cotton and sugar magnate Isaac Herbert Kempner (1873 to 1967), who was mayor between 1917 and 1919. (His granddaughter, Lyda Ann Thomas, served as mayor between 2004 and 2010). Kempner’s neoclassical mansion with its Corinthian columns still stands (1500 Broadway). Congregation Beth Jacob, originally Orthodox, started as the merger of two congregations and became Conservative. The older section was built in 1931; in 1963, a new section, including a large sanctuary, was added. Hurricane Ike wrought major damage to the building in 2008, but it is being rebuilt gradually, under the direction of Rabbi Todd Doctor, who grew up in Houston. The congregation has nearly 100 families (2401 Avenue K; 409-762-4545; www.congregationbethjacob.org). Congregation B’nai Israel, the first Reform congregation in Texas, founded by German Jews, built a brick-faced Victorian synagogue with stained-glass windows in 1870 (816 22nd Street). Today, that building is a private residence, painted white; the current B’nai Israel is a Modernist red-brick building (3008 Avenue O; 409-765-5796; www.cbigalveston.org). The old cemetery has two Jewish sections. Kempner and Michael Seligson, Galveston’s first Jewish mayor, are buried there. Michael Dell, founder and CEO of Dell computers and noted for his vast wealth and controversial business practices, is a Houston native. Investigative journalist Marvin Zindler (1921 to 2007) was famous for his Rat and Roach Report on local restaurants and for his exposé that led to the closure of a long-running brothel known as the Chicken Ranch (immortalized in the Broadway musical, later a film, The Best Little Whorehouse in Texas). The British-born rabbi Henry Cohen (1863 to 1952) was nationally known for his relief efforts after the 1900 hurricane, for his work with the Galveston Plan and for his pioneering efforts to rehabilitate former convicts. He was the rabbi of Congregation B’nai Israel in Galveston from 1888 to 1949 and was the longest-serving rabbi in the United States. Isaac’s Storm: A Man, a Time, and the Deadliest Hurricane in History (Vintage) by Erik Larson tells the story of the 1900 hurricane. The novel Allen’s Landing: The Authentic Story of the Founding of Houston (A.C. Allen and J.K. Allen) by Ralph E. Dittman describes the formation of the city. The 1983 docudrama West of Hester Street by Allen Mondell and Cynthia Salzman Mondell tells the story of the Galveston Plan. Larry McMurtry’s Terms of Endearment (Simon and Schuster), portraying the complex relations between a mother and daughter, is set mainly in Houston; the 1983 film stars Shirley MacLaine, Debra Winger and Jack Nicholson. The much-lauded docudrama Apollo 13 (1995), about America’s third lunar mission, was filmed at the Johnson Space Center. Houston’s weather is best in April and November; May and October run a close second. Keith Rosen is an excellent guide whose knowledge of Houston history encompasses all things Jewish in Houston and Galveston (713-392-0867; www.houstonhistoricaltours.com). This is definitely a car-based city. But visitors who find accommodation in the museum district can walk to many major museums, including the Rothko Chapel, the Museum of Fine Arts and the Holocaust museum. La Colombe d’Or, for example, is an elegant, Jewish-owned boutique hotel in the mansion built in 1923 for oil magnate William Fondern (3410 Montrose Boulevard; 713-942-1073; www.lacolombedor.com). Nearby is the Morty Rich Hostel, named for the son of Jewish philanthropist Hershel Rich, which offers budget accommodations with many amenities (501 Lovett Boulevard; 713-636-9776; www.hiusa.org/houston). The oldest and best-known kosher bakery is the Three Brothers Bakery (4036 S. Braeswood Boulevard; 713-666-2253). The Houston Kashruth Association (www.kosherhouston.org) lists many dining establishments, including Aroma Pizza Café (6285 Bissonnet Street; 832-460-0194) and Madras Pavillion (3910 Kirby Drive; 713-521-2617). And kosher food is available at major sports events, such as Houston Astros games. I live in La Jolla, California. I have cousins…Ronna and Mandy Selber. Do you know them. daughter who lives in Jerusalem. Do you have any “Maltz” relatives in San Diego? I know some “Maltz’s” from South Africa.